An elegant looking snooker table with a 9” diameter tapered leg. 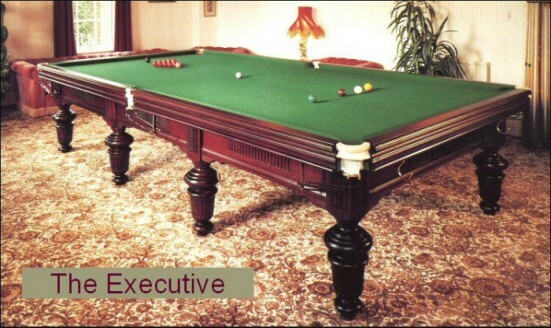 The Executive snooker table features carved cushion panels and side frames. Fitted with Hainsworth Match championship cloth and best quality English Northern Rubber cushions. This picture is from an actual installation and is reproduced with the kind permission of the owner. Alan Phillips Snooker manufacture snooker scoreboards and snooker lighting. Alan Phillips Snooker make snooker and pool tables for snooker clubs, social clubs and professional snooker players. Alan Phillips Snooker supply snooker tables to Cyprus, Germany, Austria, France, Spain and Belgium.